I never would consider myself someone who is “good at decorating”. 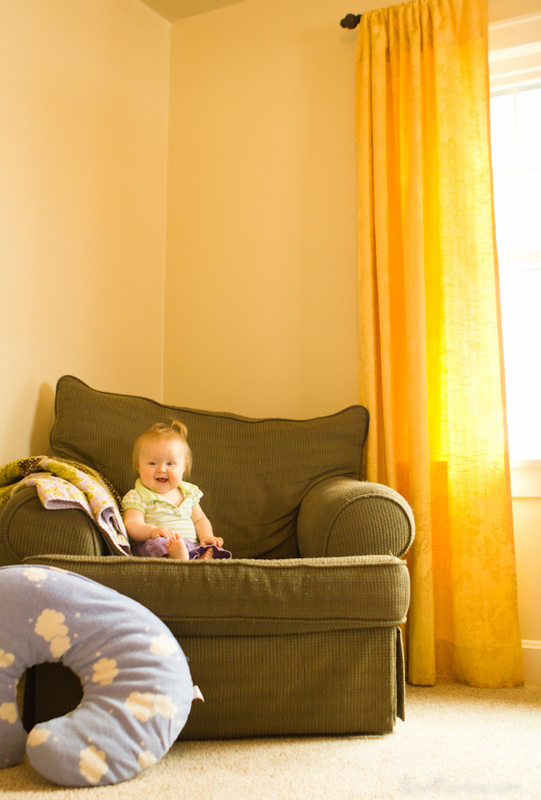 I was barely an adult when we bought our home and I became a stay-at-home-mom. Six years later, I finally feel like I understand our home and family well enough to inject finishing touches into our spaces. With the gloomy grey winter looming ahead, it was time to stop collecting ideas and start making them happen. And the place to make it happen in? The place I spend 85% of my time in – my living room. I like to think of it as “Project De-Brown-ification”. Andy and I jump-started the project over Thanksgiving weekend by painting our living room walls a lovely pale cream (Sherwin Williams Antique White and Behr Swiss Coffee for the trim). Soon after, we had new carpeting installed. It was astonishing how those two things made our living room looked 100,000,000 times cleaner. 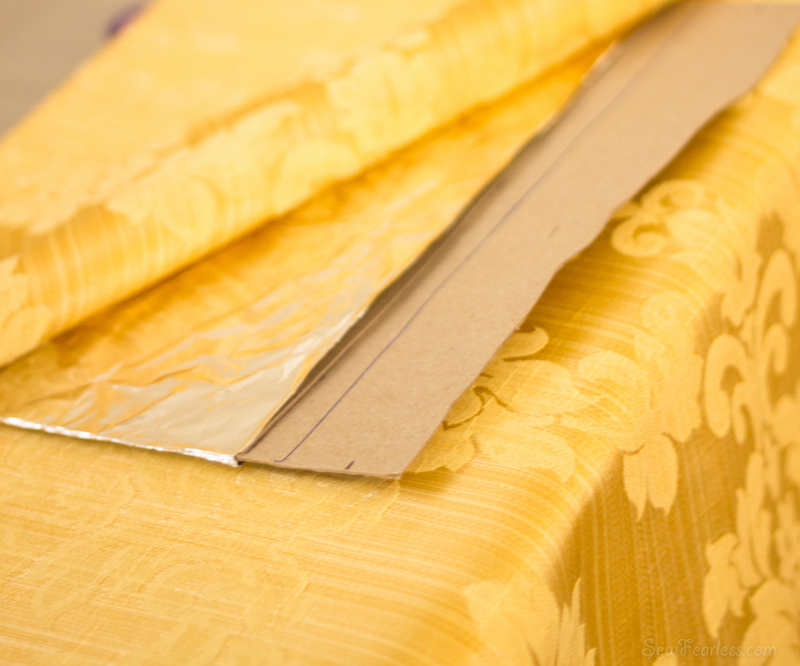 Then, I scored some fabric sunshine at 50% off red tag pricing… and brought home 13 yards. And during the break from the Minoru Sew-along this weekend, I cranked out these curtains. I had dragged my feet getting started with it. It seemed like it would be too boring of a project, but as it came together I got that heart palpitation sort of excitement a good sewing project gives me. Now that they are done, I can’t stop grinning like a fool at them. Want to inject some fabric happiness into your home? 1. 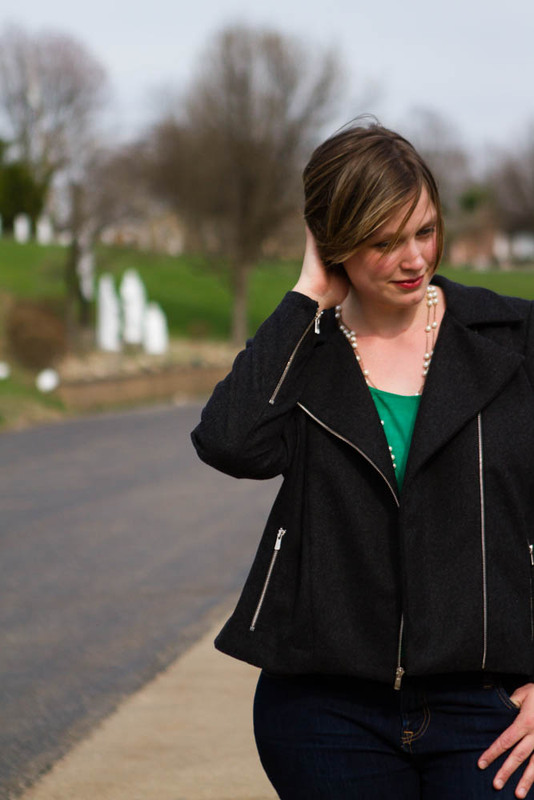 Get yourself some stitch witchery. I don’t know how I’ve missed it for all these years, but it did a way better job than pins would have holding the hems in place for sewing. Did I mention that there were FOUR floor length panels? 660 inches of hem?!?! fun times. 2. Make a handy little iron-safe ruler for your wide hems. I cut a rectangle out of a cereal box and covered it with aluminum foil (to make it steam-proof). Then I marked the hem measurements on it with a thin permanent marker. 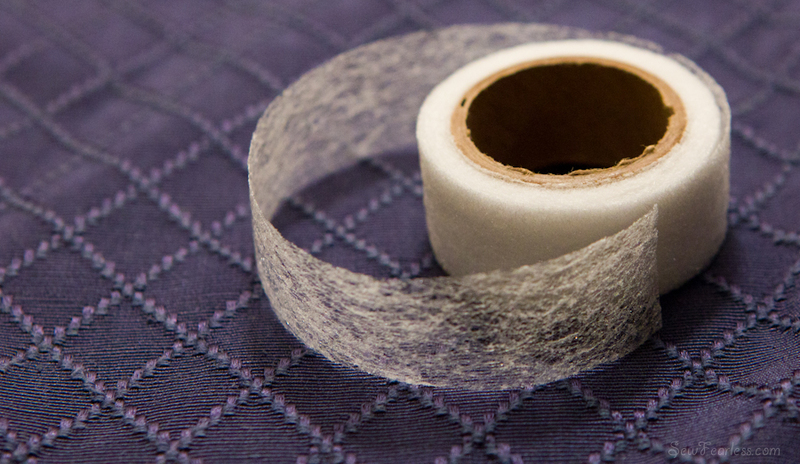 For smaller hems, you could use the Scientific Seamstress’ handy printable Folding Templates. 3. Experiment with curtain hanging styles. 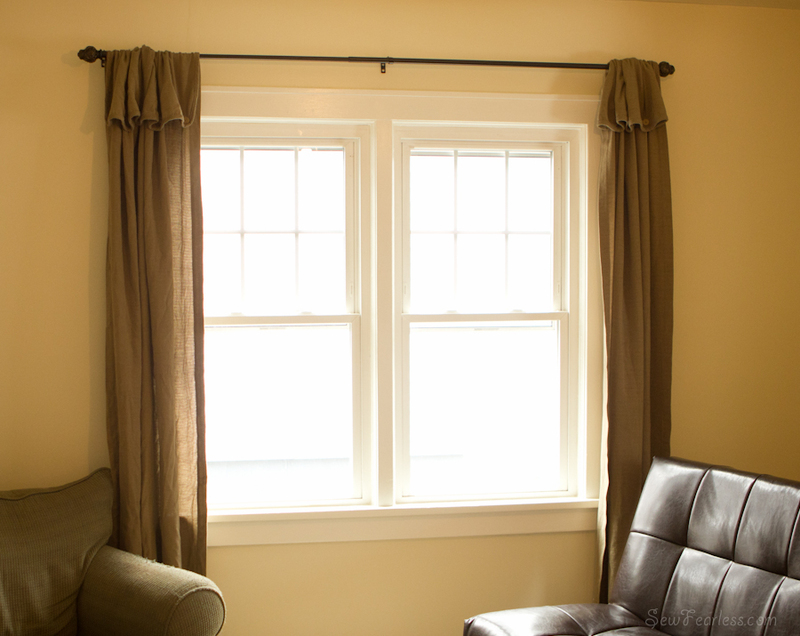 I am amazed by how much the width of the rod pocket affects the look of the curtain. A tighter fit would have changed the gathering and drape. Take time looking around at curtains that you like and testing things out with pins. I’m sure glad I did. 4. Watch out for obvious patterns. You may need to match it across the curtain pairs. I’m happy I realized this before it was too late to fix. It would have driven me crazy! 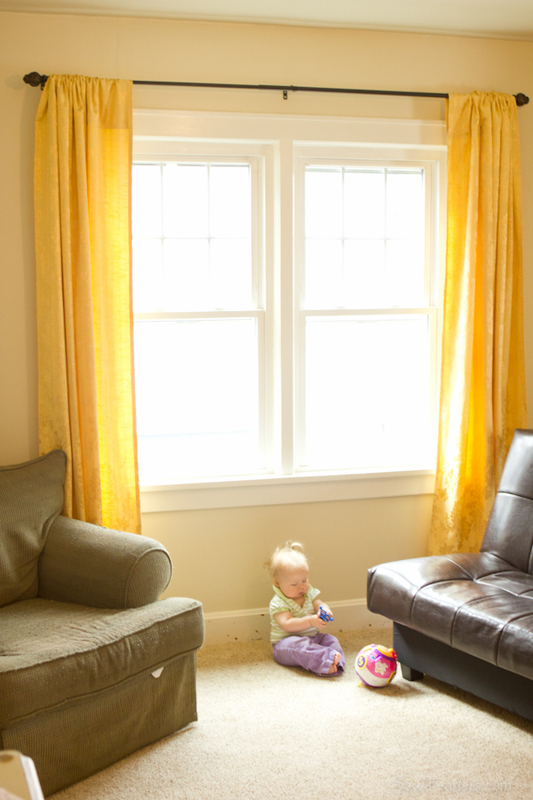 Curtains are such a great beginners sewing project. In fact, they were some of my first few projects when picked up sewing again in 2005. The biggest one being the gingham curtains I made for my baby’s nursery. I found the idea for them in the book Simple Curtains. Curtains may be rectangles, but fabric type, gathering ratios, and hanging methods make all change the look of the curtain. 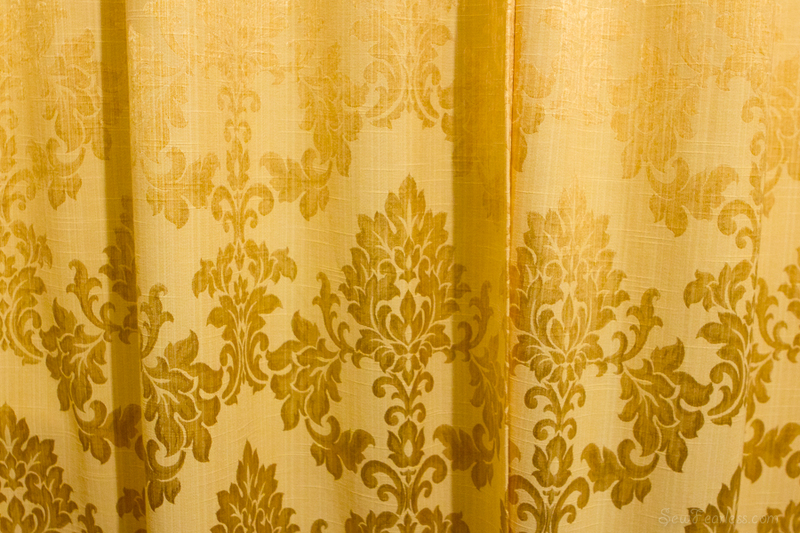 Simple Curtains explained it all and a remember loving all the beautiful project ideas in it. 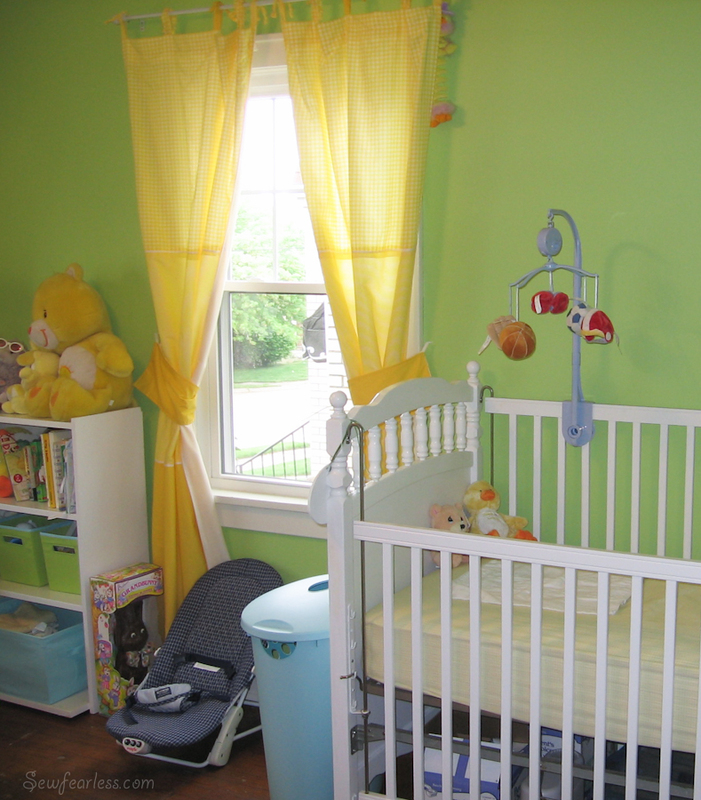 Nursery 2005. 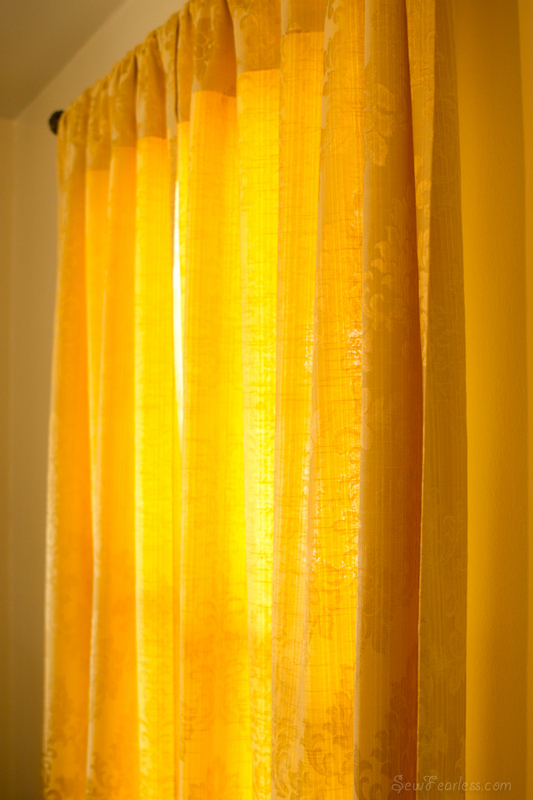 Apparently, I have a thing for yellow curtains. Who knew? 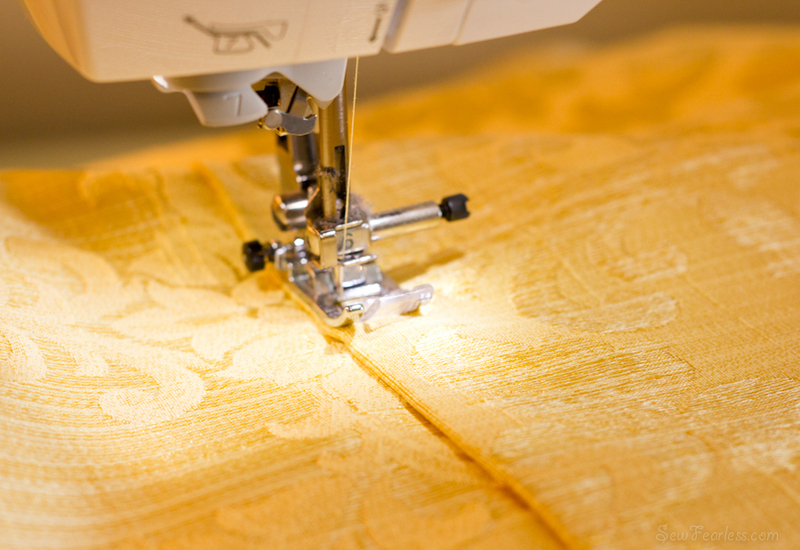 About.com breaks down how to calculate and cut your fabric lengths. 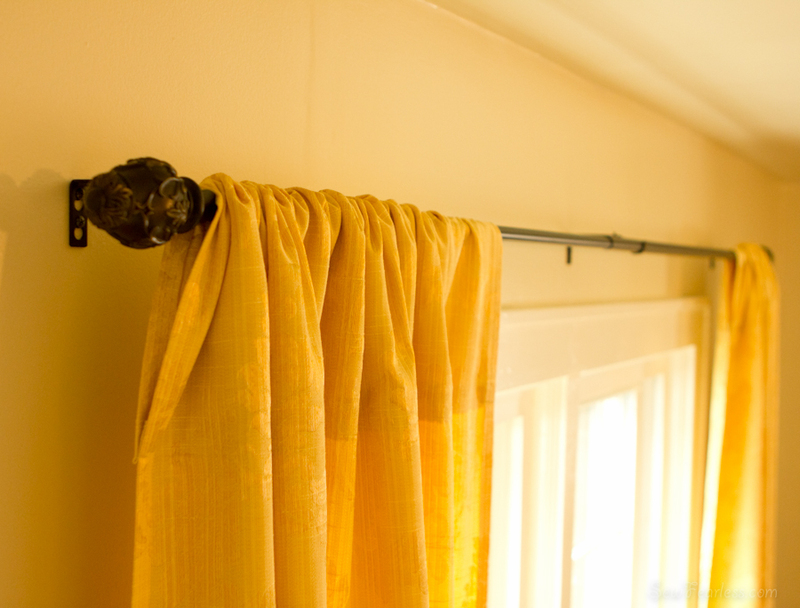 Design Sponge shows how to make the most basic “rod pocket” curtain in their sewing 101 series. House of Hepworths and Naptime Novels both have detailed posts on how to make a lined rod pocket curtain. ThreadBanger Projects shows how to make tied cafe curtains. Kitschy Coo made quick tab-topped curtains. A Brooklyn Limestone added grommets to her drapes. MyCurtainStyles showcases a variety of drapery hanging methods. 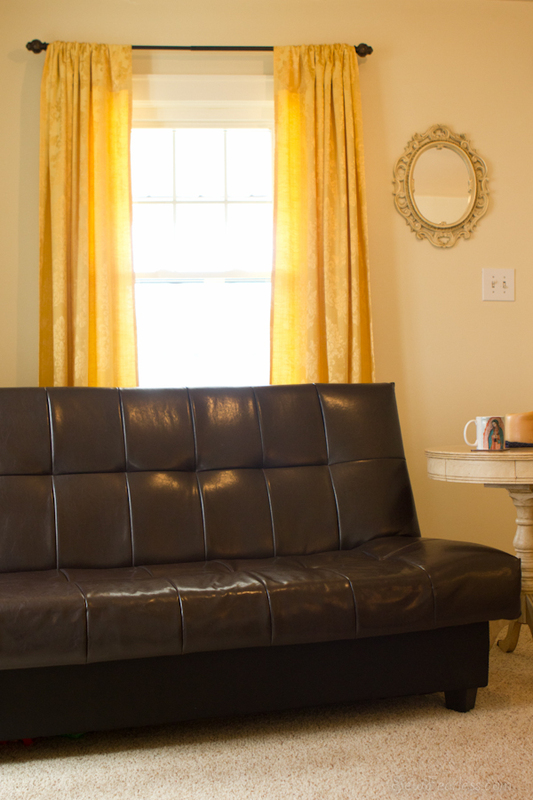 Plus an amazing collection of curtain diys and tutorials at The Inspired Room. Plus, I’ll add more resources to my “curtain” Pinterest board as I find it. So find some fabric that makes you happy, and surround yourself with it! Can you guess what Happy Fabric project I have my eye on next? It’s either the chair, the boppy, or you’re going to gently wrap your sweet little Gladys in some yummy yellow fabric. I say go for the baby. Curtains look great. Awesome fabric. Length is perfect. p.s. I’ve totally noticed you tend towards yellows and oranges. I LOVE these. I need yellow curtains for the dreary winter, too, I think. Whenever I sew curtains I think, “So easy, just a rectangle.” And then I am sitting there for-ever sewing all those long, long hem. Thanks for the tips in this post. I’d never thought or heard of doing a hem ruler. And I’ve learned about rod pocket size the hard way! They look fab! These are so fun! They bring some sunshine to the room.